Dogs are a man’s best friend, and they deserve every last bit of love in the world. For most, dogs are like a part of their own family. But sadly, not everyone thinks of their lovable friend that way. For some dogs are just a mere accessory, or else why would they treat their pets this way? The Midwest is currently in the grips of the icy polar vortex and it’s the coldest its been in a long time. A man from Minnesota reportedly left his dog out in the cold and is now being questioned for animal cruelty. According to Fox News, 29-year-old Dang Xiong, left his dog outside his residence in Brooklyn Center, Minnesota, on Tuesday afternoon when temperatures had dropped to -9 degrees F. Xiong was cited for a misdemeanor, Daily Mail reports. Upon inspection, police officers found the poor dog inside the cage shivering, and he was tied to a chain, with very little food and water inside the cage. The authorities subsequently slammed Xiong with a citation for inhumanely, unnecessarily, cruelly beating, injuring or abusing an animal — a fine that carries a penalty of up to $1,000 in Minnesota. 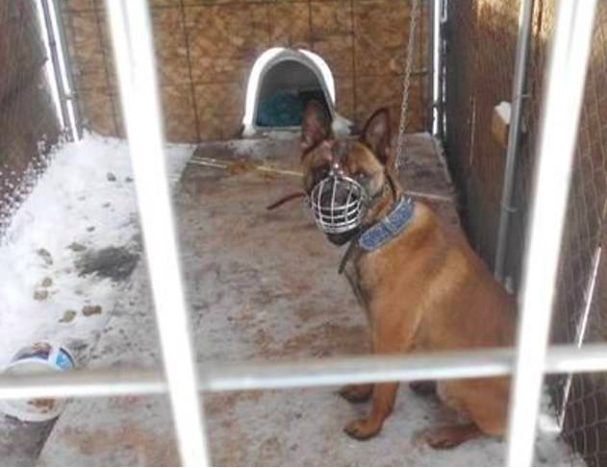 According to Bring Me The News, the officers placed the dog in the care of Pets Under Police Security (PUPS) center in Maple Grove, Minnesota — a pet impound facility serving numerous towns in the vicinity. The PUPS Facebook page advised pet owners that “If it’s too cold for you outside, it’s too cold for them. Like people, cats and dogs are susceptible to frostbite and hypothermia. Please bring them inside!” PUPS is a facility for animals in the Brooklyn Center, Brooklyn Park, Champlin, Crystal, Maple Grove, New Hope, and Plymouth areas. The poor dog was left outside during the polar vortex which is quite life threatening. It has descended over a sizeable area of the United States with temperatures reaching dangerously low levels. Pictures show just how bad the cold is, with even water freezing right out of the tap! Since Tuesday, the lethal weather phenomenon has already claimed at least 13 lives. In Minneapolis alone, temperatures dropped to as low as -24F. As per The Guardian, the bitter cold is expected to turn into spring-like weather by early next week, according to forecasters. Only a few days after such frigid conditions, temperatures are expected to rise as much as 80 degrees Fahrenheit in a few regions. According to experts, the rapid thaw is unprecedented and could create its own problems like roads crumbling, pipes bursting and rivers flooding. Meteorology director of the Weather Underground firm Jeff Masters said, “I don’t think there’s ever been a case where we’ve seen [such a big] shift in temperatures. Past record-cold waves have not dissipated this quickly. Here we are going right into spring-like temperatures.” The polar vortex comes from the North Pole that was being pushed south into North America. Because of this, it made some parts of Illinois colder than Antarctica on Wednesday, and the windchill factor made Los Angeles feel as much as 100 degrees Fahrenheit warmer than some parts of the midwest.